Images taken at the scene depict dazed victims, bloody bodies and twisted steel. At least two explosions ripped through two subway stations in Sint Pietersburg in Russia. According to reports, the lives of at least 10 people were claimed and others injured. Children were amongst those injured. The explosions allegedly took place at the Institute of Technology station and the Sennaya Ploshchad metro station. Emergency services and at least eight ambulances were on the scene. The Sennaya Ploshchad metro station is one of the main subway stations in the city. It’s under a massive shopping centre and Gazprombank, the third biggest bank in Russia. 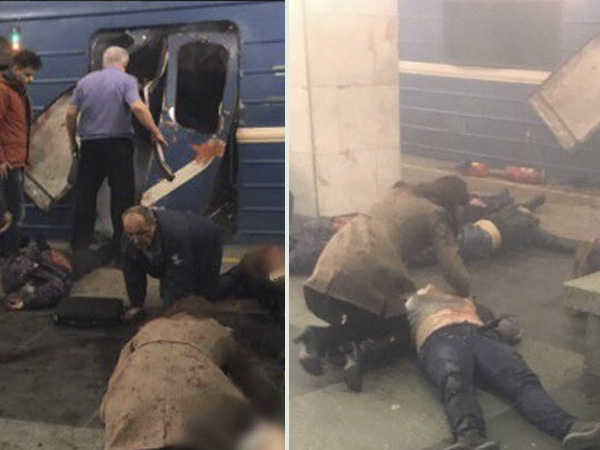 Russian news agency Sputniknews reports that one of the explosions occurred in one of the carriages. It is alleged that one of the bombs were filled with shrapnel. Russian leader Vladimir Putin is visiting the city today. Seven of the subway stations on these routes have been closed for the time being.